Welcome to school, a building of brick "full of soul and heart," eager for students and staff to fill its halls with sounds. 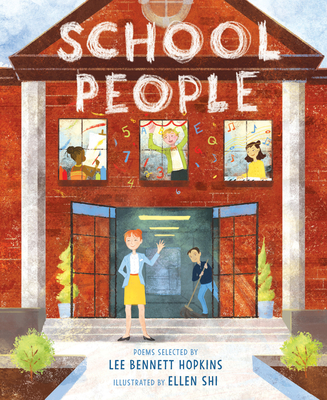 This anthology of fifteen poems celebrates the grown-up people that children encounter throughout the course of their school day: the school bus driver with her morning smile, the teacher who inspires imagination, the rarely seen, yet caring custodian, and the nurse who heals hurts, big and small. There's even a poem about the school building. Award-winning poet and anthologist Lee Bennett Hopkins has compiled this marvelous collection featuring a variety of brand-new works by well-known poets and beautifully imaginative artwork by illustrator Ellen Shi. Lee Bennett Hopkins is a poet and anthologist who is recognized as "the world's most prolific anthologist of poetry for children" by Guinness World Records. In addition, he has been honored with the Christopher Award, the Regina Medal, the NCTE Award for Excellence in Poetry for Children, and the University of Southern Mississippi's Medallion for "lasting contributions to children's literature". He lives in Cape Coral, Florida. Visit leebennetthopkins.com.